Nat’s Single Sentence Synopsis: A dramatic story of friendship that spans decades, and all the things that go along with it–love, loyalty, support, and sacrifice. Long-term friendships between women can be difficult to maintain, especially if one friend constantly travels the globe pursuing a career while running from a painful reality. Ali Gutierrez is the friend who stayed behind, the port in the storm, where Cora can come take refuge. But Ali and Cora are tethered to each other by more than just a decades’ old friendship; Cora gifted Ali with the child she and her husband Benny couldn’t have on their own. With Cora’s egg donation, Ali was finally able to carry a baby to term, a miracle child who bonds them all together. Fifteen years later, Cora is back in South Florida with grim news that will destroy Ali’s hope for a second miracle baby. But things in Florida are far from calm, with Letty, the miracle baby-now-teenager–at the epicenter of a storm that ravages life as they knew it. 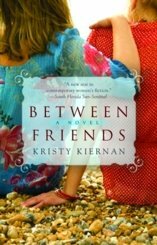 Kristy Kiernan’s third novel, Between Friends, is well-paced and interesting, but I struggled with it for a few reasons. Ali and Cora face more trauma and upheaval in a few months than most people face in a lifetime. It was difficult to accept all the suffering and plot twists that befell the characters in such a short span of time. As a reader, I like to visualize characters but had trouble doing so with this novel because physical description of many of the main characters is spartan or introduced too far into the book. I never fully connected with Ali because I couldn’t get a bead on her appearance. The book is told from three viewpoints and Kiernan did an adequate job shifting between the voices. I was able to get inside the heads of the three female protagonists, which helped me better understand their motivations and actions. Between Friends is a quick read but squares off with difficult and painful topics. The novel is filled with plot twists and turns and offers lessons about friendships between women, relationships between parents and children, and the dynamics between spouses in a marriage. For me, it just tried to cover too many issues. I enjoyed the South Florida references–my parents have a home in the Venice Beach area–and I’ve visited many of the towns mentioned. Having a personal connection to the setting helped me connect visually with the surroundings, but I didn’t have enough information about some of the characters to ever get them into sharp focus. I don’t think this is the book for me. Thanks for the review! I’m totally with you: I have to know what characters look like before I can really connect with them! So funny you mention that. In the novel I’m reading now — Katherine Center’s Get Lucky — the sisters are described as completely alike in appearance with bright red hair, and that’s really catapulted me through the plot. Looks do mean something! .-= Meg´s last blog ..Recent books that bored me =-. Sounds like maybe it is a bit overplotted. .-= Jenners´s last blog ..Show Me 5 Saturday: "Julie & Julia" by Julie Powell =-. Maybe the author should have taken all her ideas and written two books instead of one! .-= Ali´s last blog ..The Lunatic, the Lover, and the Poet–Myrlin Hermes (book review) =-. I’ve gotten mixed messages on this one. Think I’m going to pass for now. .-= Lisa´s last blog .."The Singer’s Gun" by Emily St. John Mandel =-. Oh, that’s really interesting that you need to be able to actually picture the characters. I tend to completely gloss over any mention of physical appearance. I generally don’t picture the characters in my head at all, and if I do it is based more on whatever I make up about them than what the author writes. For instance, when watching the first Harry Potter movie I was SHOCKED that Malfoy had blond hair, although when I went back to the books, it said that very clearly. Oh, I’m sorry you didn’t enjoy this one! I have it to review and am interested to see what I think.